Spring is very early this year, and the woods around Uppsala are snow-free by now. 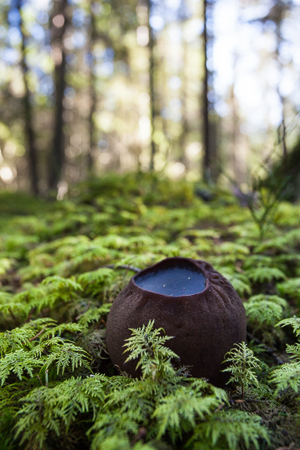 An early, attractive and rare fungus is Sarcosoma globosum ("Bombmurkla" in Swedish), shaped like a cartoon bomb, this fist-size fruit-body looks like a chocolate-rich creation at a cake shop and usually appears just after the snow has melted. S. globosum is red-listed in Sweden, classed as vulnerable. It's distribution covers a large part of the country, but is concentrated around Uppland and surrounding counties. According to the Swedish Species Information Centre the major threats are forestry, including clerar-cutting and the replacement of spruce stands by pine plantations. In addition gravel quarries are regarded as a factor with a negative impact on the species.